The characters escape rapidly flowing lava on an acid lake. Photo Copyright, Sony Pictures. The 1997 film Dante’s Peak stars Linda Hamilton and Pierce Brosnan in an action-packed, disaster driven plot. The two race to save a small town—and themselves—from the catastrophic eruption of the town’s namesake—a long-dormant volcano. Along the way, their characters, Harry and Rachel, encounter poisonous gasses, earthquakes, acidic lakes, rivers of lava, and violent showers of falling rock. But how much of the action that propels the plot is scientifically accurate? Disaster movies have a reputation for pumping up the drama at the expense of scientific fact. However, allowing for some artistic license to keep the action level high and compress the story into a reasonable time-scale, Dante’s Peak’s adherence to scientific fact holds up reasonably well—with a few exceptions. Rachel (Hamilton) plays the mayor of a small town of Dante’s Peak, named for the volcano it sits below. As well as being the mayor, she’s a single mom and a business owner, so she’s appropriately alarmed when volcanologist Harry Dalton (Brosnan) is sent to investigate recent stirrings of activity on the mountain. When Harry’s USGS team arrives to begin monitoring the volcano, the movie gets a lot right—especially about some of the ways volcanic activity is monitored. Harry’s boss assures the town council they’ll use seismometers and tilt meters, take gas readings and even “bounce lasers” off the mountain—referring to remote sensing used to detect if the mountain moves or bulges. These steps are in line with how the USGS describes the comprehensive monitoring used to forecast an eruption1. But, in a later scene, there is a violent earthquake that, combined with a plume of ash, sends the town into a panic and precipitates the evacuation. This scene is a mixed bag of fact and fantasy, but probably necessary to kick the drama into a higher gear. While volcanic activity can be accompanied by earthquakes, they are normally of a smaller magnitude. The USGS website says that volcano-associated earthquakes rarely exceed a 5.0 magnitude2. Yet, when the earth begins shaking in the movie, buildings, signs and even freeway overpasses come crashing down. The Northridge quake that took out sections of the Santa Monica freeway in 1994 was a magnitude 6.7 earthquake3—more than 50 times4 more powerful than the largest earthquakes that typically accompany volcanic eruptions. One of the most glaring problems with the science in Dante’s Peak are the scenes involving lava flow. Composite volcanoes like the one in Dante’s Peak are formed at the edges of subduction zones, where magma collects in chambers. When pressure reaches a critical point, the magma bursts through the earth’s crust in violent eruptions. Over millennia, these eruptions build up the cone-like shape of the volcano5. While composite volcanoes can send a lahar of water and debris gushing down a mountainside wreaking havoc, it’s unlikely to send a river of lava to do the same. 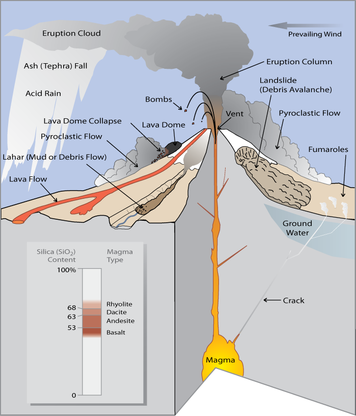 This is because the type of lava responsible for the creation of a composite volcano is highly viscous and less likely to flow freely because of its high silica content. Instead, pressure builds up beneath the volcano, which can lead to the kinds of pyroclastic explosions that drive the rest of the movie’s action. Harry drives his truck across a bed of crusted lava flow. 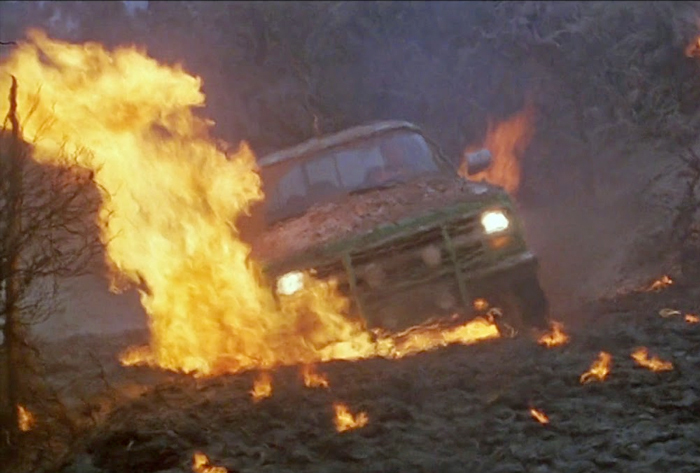 Not only would his tires have burst, as they do in the film, but his gas tank would have ignited in the 1200 degree heat. Photo Copyright, Sony Pictures. Many of the other visually dramatic scenes are more accurate. Air thick with volcanic ash can bring down a helicopter2. Minor earthquakes can cause the kinds of rock falls that injured a member of Harry’s team. Volcanoes can create powerful explosions, sending the kind pyroclastic heat, gas, and rock that ultimately destroys the town of Dante’s Peak6. And yes, Harry and Rachel could escape the heat and force of a pyroclastic flow by driving into a mine shaft. After all, a prisoner in the path of the 1902 Mt. Pelée eruption survived because his stone cell had no windows7. And finally, volcanic activity can raise the acidity level of lake water—just not in the course of a few hours like what happens when Harry and Rachel’s boat begins sinking in the acidic lake. According to OpenLearn, a one kilometer square lake 50 meters deep would require about 10 billion kilos of sulphuric acid to create a solution acidic enough to cause the boat-melting drama shown in the movie8. This is incredibly unlikely, but served to further raise the stakes to life-or-death and offered grandma’s character some redemption for her earlier stubborn refusal to come down the mountain. That said, there is one way to rapidly drive a lake’s pH down enough kill fish and it’s worth mentioning because it serves to demonstrate just how dramatic the pyroclastic action needs to be. In her article for LiveScience, Becky Oskin discusses the 1996 eruption of the Karymsky volcano which also included an underwater eruption at a nearby lake9. The eruption sent 30-40 million tons of pyroclastic material raining back into the lake, flooding it with sodium, sulfate, calcium and magnesium and dropping the pH to 3.2. Even in such a dramatic example, the water became only as acidic as grapefruit juice. However, as Oskin points out, it’s unlikely the fish would have felt the acid, as the eruption would have been so powerful it would have cooked or clobbered the fish to death first. Certainly, the science of Dante’s Peak holds up better than its contemporary film, “Volcano”, also released in 1997. The setting of Dante’s Peak is accurate, as it takes place in the volcanic Cascade Range, which lies along a subduction zone. In Volcano, the plot is driven by a new volcano that sprouts suddenly along the San Andreas fault, a transform—not a subduction—fault. Volcanologists surveyed after seeing the movie seemed to agree that the filmmakers got it mostly right, but pointed out that biggest error might be one of human behavior, not volcano. After signs of a pending eruption had become clear, they said it was unrealistic that they mayor and USGS team waited until the next day to hold a meeting about evacuation10. Even if it isn’t perfect, Dante’s Peak serves as an entertaining and moderately educational example of the dangers inherant to living near a volcanic mountain. USGS PDF File, “Volcano Hazard Program FAQs.” 2011. Taylor, Alan, “The Northridge Earthquake: 20 Years Ago Today.” The Atlantic, January 17, 2014. Cain, Fraser, “Composite Volcano.” Universe Today, May 4, 2017. OpenLearn, “Dante’s Peak.” August 22, 2005. Oskin, Becky, “Stranger than Fiction: Volcanic Eruption Creates Deadly Acid Lake.” LiveScience, October 14, 2013. Reich, Kenneth, “Volcanologists Survey Dante’s Peak.” Los Angeles Times, February 11, 1997.